Posted on September 28, 2015 in Uncategorized by Quietly Team. Is Facebook in decline? Are small businesses in decline? Is society in decline? Sorry for the last hyperbole, but it is these pundit catchphrases that commentators and content creators like to throw into the void every now again to see if they’re heard. To answer these questions, no: Facebook is not in decline (probably). After all, the social network, not Google, is the top referral source for digital publishers. Small businesses, on the other hand, are on decline depending on whom you ask and what industry you’re asking. And society? That depends on your ideology. However, whether there is a decline in the relationship between Facebook and small businesses is a horse of a different color. For years, marketers and online writers have urged small businesses to get on social media, like Facebook, to establish their online presence. At the same time, Facebook actively encouraged these businesses to use their services as well (free and otherwise), promising big conversions. Today, Facebook counts over 40 million active small business pages, where active is defined as having posted something in the last 28 days. In spite of the success for Facebook (marked by more businesses on their site), 64% of small businesses name social media and marketing as their top challenge, according to this recent survey. Presumably, a large part of those challenges can stem from Facebook’s frequently changing News Feed algorithm. In 2012, Facebook announced pages organically reach only 16% of their fans on average. In 2014, Social@Oglivy published a whitepaper that shows organic reach finds 6% of their audiences; for pages with 500,000 plus fans, that percentage drops to a mere 2%. Facebook is quick to point out two reasons why this is the case. First, there is more content than ever that created a large playing field for competition. Second, the algorithm used for News Feed must adapt to keep it engaging for their users. Facebook’s MO, after all, is to engage their users with tailored content and feeds. Moreover, their News Feed algorithm changes so often and for such “random” reasons, that it is difficult to keep up. For example, Facebook now penalizes posts that are deemed “overly promotional,” further reducing any organic reach that has led to big losses for some businesses. In an age where tech companies are trying to become media companies, it’s easy for the likes of Facebook to refocus their efforts on their infamous News Feed while they’re jumping in on video, messaging, mobile and more (so much more). However, in doing so, they’ve largely abandoned the small businesses they urged and courted to create Facebook pages only a few years ago. We too have hit a snag in our Facebook reach and engagement ever since the latest algorithm update; Quietly is a small business, too, after all. So what’s a small business marketing to do thanks to Facebook’s abandonment? Facebook is not the be all end all for small businesses, so it’s best that you explore other platforms that make your business visible. The smartest thing to do may be to create and upkeep a Google+ page for your business (and SEO), as people will probably type a search there before Facebook. Otherwise, look at the type of company you are and think where you can communicate best. If you’re a restaurant, for instance, join Instagram, where you can promote deals and photos of your food. If you’re an internet startup with things to say, join Twitter. Some brands are even going back to publishing print to promote their content and company. 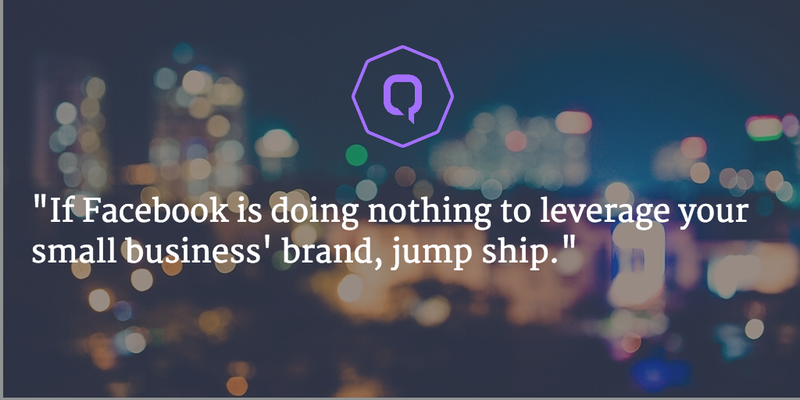 If Facebook is doing nothing to leverage your brand, jump ship. If there is some value to staying on Facebook, stay on Facebook. Just change how you ask your fans to engage with you. It used to be as simple as asking for a “like,” but now it’s better to ask for fans and people who use your business to “tag” it in their photos or posts. This will increase your chance of being seen on someone else’s News Feed, which is the whole point of Facebook, anyway. It’s the best way for you to start changing how you measure engagement. Additionally, tagging and not liking encourages a more active engagement. Asking your audience to comment and tag requires more effort and can better show how engaged your audience is as opposed to a like. Emails are delivered 90% of the time; Facebook posts are delivered 2% of the time. With math like that, consider kicking it old school by building an email newsletter list. No matter the frequency or promotional/ curated content, a newsletter is typically opened about 20% of the time. Free advertising on Facebook is all but gone. To make a marketing impact on Facebook, small businesses need to pay to play. Many have already figured this out; the vast majority of Facebook’s net of 2 million active advertisers come from small to medium-sized businesses. On average, these businesses spend an estimated $5 to $50 a day on promoted posts and ads on Facebook. To make the most of your Facebook ads, check out this guide. Quietly is still on Facebook. We’re constantly tinkering with our strategy and have ventured into exploring other platforms, measuring engagement, distributing email and even paying to play. Right now, it makes sense for us to be on the platform, but we certainly don’t put as much effort on it as we did a year ago. Again: Facebook and small businesses are not in decline, separately. But together, it’s inevitable that they will not benefit from each other in the same ways anymore. Of course, things could change once more—they could both be “in decline” again. For more info on optimizing social and content marketing strategies for small businesses, product updates and industry insights, follow us on Facebook and Twitter and sign-up for our monthly newsletter.